Every year since I started my blog I've written about a pagan diary being the perfect gift for pretty much any witch at Yule. This year, it's a bit different. Sure, diaries are still great presents, but I'd also recommend other kinds of year books, journals and almanacs. 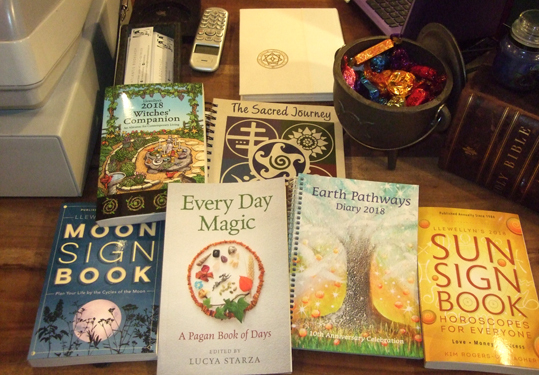 In particular, I'm going to give a great big plug for the Moon Books' community book I edited - Every Day Magic - A Pagan Book of Days. I know I'm biased, but I really do think it is a wonderful book - I was absolutely bowled over by the entries I received from around 50 contributors, offering a different thing to do or celebrate every day of the year. Both The Atlantis Bookshop and Treadwell's Bookshop in London had copies last time I was at the shops. Picking one up there is probably best if you are already in London and want to make sure you have the book in your hands in time for Yule - but do phone or email in advance to reserve a copy just to make sure. Both shops are near the British Museum. The photo at the top shows Every Day Magic with diaries and year books on the counter at The Atlantis Bookshop.